Motorcycle cooling systems are responsible for maintaining the correct operating temperature of the engine. Antifreeze/coolant serves several purposes as it flows through the engine�s heating core and cooling system. It prevents rust and corrosion from forming on internal parts while absorbing excessive heat from the engine and transfering it to the air at the radiator. Replacement in accordance with Kawasaki recommendations of every 2 years or 18,000 miles, whichever is sooner, provides fresh rust and corrosion inhibitors and reduces the chances of freezing in extremely low temperature or boil over in extremely high temperatures. 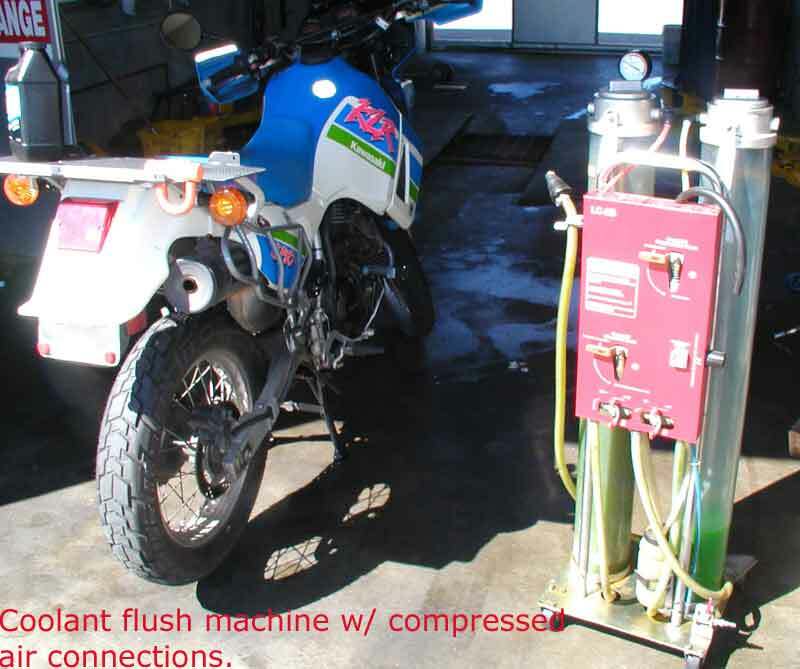 This photo essay shows a process using state-of-the-art service equipment, to evacuate the old antifreeze/coolant.  A greater range of protection during extreme weather conditions.  Disposal of the old antifreeze/coolant in an environmentally responsible manner. Four Strokes such as the Kawasaki KLR 650 will vibrate fasteners loose over time, thus I use Blue Loctite threadlocker when reinstalling most fasteners. Coolant flush machines such as this one can be found at your local automobile service shop and Quick Lube oil change centers. I have been disposing my old motor oil at the local Jiffy Lube, and asked them if I could dispose of my old coolant/antifreeze as well. One question led to another and they agreed to remove my old coolant using a pressurized coolant recovery tank. If you show up when they are not too busy, with all your side covers already removed, and they know you are coming in advance, you might be able to get the same help I recieved. 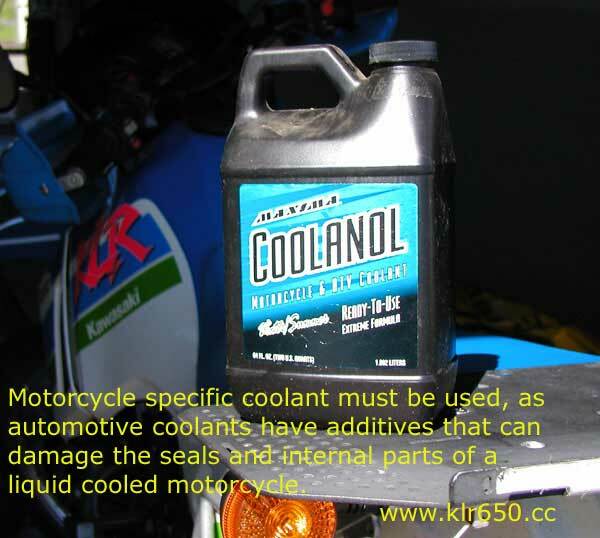 Coolanol is premixed and one bottle will do several coolant changes on the KLR650. The coolant capacity of the Kawasaki KLR650 is 1.4 qt (1.3 L). WARNING: Use coolant containing corrosion inhibitors made specifically for aluminum engines and radiators in accordance with the instructions of the vehicle manufacturer. If you must add water for whatever reason, use soft or distilled water. See your KLR owners manual for additional information.